How true is this! Some dreams not only transform the life of the one who sees them, but also renovates the lives of millions of others towards a dazzling future. And one such dreamer was Mr. Dhirubhai Ambani. His success story is an example of how determination and perseverance towards your dreams can make impossible possible. This mentor of Indian corporate industry rewrote the history in golden ink. Ages to come, whenever there will be a mention of a man who built an empire from the scratch, nurtured it and shined brightly taking ahead a human force, creating a glorious future for millions of homes and giving his country a unmatchable support in these exponential times, the name that will triumph everyone’s speech is and will always be Mr. Dhirubhai Ambani. Born in a simple family in the Chorwad village of Gujarat to a school teacher, Hirachand Ambani; entrepreneurship was the dream of Dhirubhai since childhood. From selling Bhajias to the local pilgrims of mount Girnar to working as an attendant at a gas station in Yemen, Dhirubhai was a man of few words and big dreams. Constantly focussing on the wider picture, he started his first textile company in 1958. The wheels of the success train never stopped or paused and still continue to stride ahead with time. The rest is history! Dhirubhai Ambani’s vision was never restricted to the limits if a textile industry. One by one with intensive hard work, dedication and the ability to discover the unleashed talents among the new comers, Mr. Ambani expanded his arena or entrepreneurship under the brand name reliance. With the due efforts, innovative ideas and endurance to be the best of the best, Reliance India limited emerged as the largest private sector company in India. The organisation, along with the helping hand of dutiful sons of Dhirubhai- Mukesh and Anil, this core petrochemical specialised company diversified its business into other sectors like telecommunications, Information technology, energy, power, retail, infrastructure services, capital markets and logistics. Not to forget, textiles still remained one of the focal points of company’s interest. It is with his grand venture and dream that reliance generated money for its millions of share holders becoming a promising name in the Indian capital market. It is with his due efforts that created an “equity cult” in the market which not only generated large amounts of money for the investors, but also became the first Indian company to raise money in international market. A stock market’s favourite, its high credit taking in international markets were limited only by India’s sovereign rating. The company proudly holds the position of being the first Indian organisation to be listed in the Forbes 500 list. Dhirubhai Ambani is an inspiration to all the youngsters who are trying to aspire to become a remarkable entrepreneur. His motto while running this huge empire was to never let down the trust of the customers, employees and the investors who believed in his vision and helped him pave a way to success. 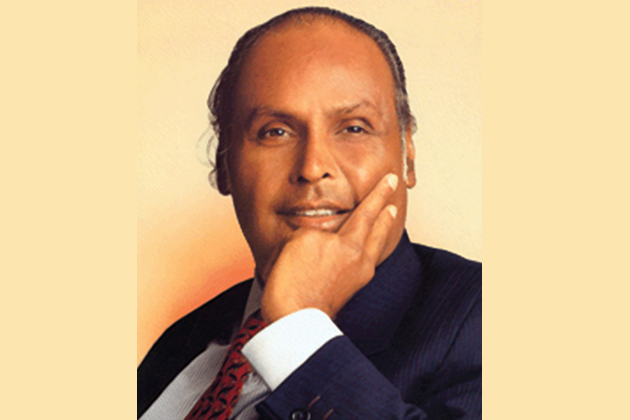 Dhirubhai Ambani was duly awarded and credited for his work to stabilize the growth of Indian economy by number of awards like greatest creator of wealth in the 20th century by the Times of India, Indian entrepreneur of the 20th century by Federation of Indian chambers of Commerce and Industry among many others. His story serves as an inspiration to millions of youthful minds filled with nascent ideas that may someday be recalled as legends, just like Mr. Dhirubhai Ambani. This entry was posted in D and tagged Dhirubhai Ambani Biography, Founder of Reliance Industries, Reliance India limited. Bookmark the permalink.